This Hubble Space Telescope photo shows the superfast star HE 0437-5439 (with arrow) as it is being booted from the MIlky Way galaxy. Asuper-hot blue star hurtling through space has been shot completely out of theMilky Way, new Hubble Space Telescope photos reveal. Astronomersthink the star is a survivor from a triple-star system that traveled throughthe bustling center of our Milky Way galaxy 100 million years ago, but made theperilous mistake of wandering too close to the galaxy's giant black hole, whichcaptured one of the stars and flung the other two out of the Milky Way. The twoejected stars then merged to form a super-hot, blue star. 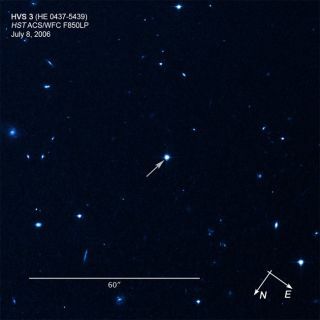 Whileit may seem a little farfetched, astronomers using NASA's Hubble Space Telescope say it is the most likely scenario for the so-calledhypervelocity star, known as HE 0437-5439, one of the fastest ever detected. "UsingHubble, we can for the first time trace back to where the star comes from bymeasuring the star's direction of motion on the sky," said astronomerWarren Brown of the Harvard-Smithsonian Center for Astrophysics in Cambridge,Mass., lead author of the study and a member of the Hubble team that observedthe star. "Its motion points directly from the Milky Way center. Theseexiled stars are rare in the Milky Way's population of 100 billion stars. Forevery 100 million stars in the galaxy lurks one hypervelocity star." Sincethe first discovery in 2005, astronomers have found 16 hypervelocity stars,most of which are thought to be exiles from the heart of our galaxy. But, thenew Hubble result is the first direct observation that links a high-flying starto a galactic center origin. Themovements of these breakneck stars could reveal the shape of the darkmatter distribution surrounding ourgalaxy. "Studyingthese stars could provide more clues about the nature of some of the universe'sunseen mass, and it could help astronomers better understand how galaxiesform," said Oleg Gnedin of the University of Michigan in Ann Arbor. "Dark matter's gravitational pull is measured by the shape of thehyperfast stars' trajectories out of the Milky Way." TheHE 0437-5439 stellar outcastis already trekking deep in the Milky Way's distant outskirts, high above thegalaxy's disk, about 200,000 light-years from the center. By comparison, thediameter of the Milky Way's disk is approximately 100,000 light-years. Astronomersused Hubble data to measure the runaway star's direction of motion anddetermine the Milky Way's core as its starting point. Brown and Gnedin's teamthen calculated how fast the star had to have been ejected in order to reachits current location. "Thestar is traveling at an absurd velocity, twice as much as the star needs toescape the galaxy's gravitational field," said Brown, who discovered thefirst unbound, hypervelocity star in 2005. "There is no star that travelsthat quickly under normal circumstances ? something exotic has to happen." Afterstudying the star, researchers noticed that some of the calculations did notseem to add up. Basedon the speed and position of HE 0437-5439, the star would have to be 100million years old to have journeyed such a distance from the Milky Way's core.Yet its mass ? nine times that of our sun ? and blue color mean that it shouldhave burned out after only 20 million years ? far shorter than the transit timeit took to get to its current location. Themost likely explanation for the star's blue color and extreme speed is that itwas part of a triple-star system that was involved in an ill-fated encounterwith the Milky Way's monster black hole. Thisconcept for imparting an escape velocity on stars was first proposed in 1988. Thetheory predicted that the Milky Way's black hole should eject a star about onceevery 100,000 years. Brownsuggests that the triple-star system contained a pair of closely orbiting starsand a third outer member that was also gravitationally tied to the group. The closeencounter enabled the black hole to wrench the outer star away from the tightbinary system. Thedoomed star's momentum was then transferred to the stellar twosome, boostingthe duo to escape velocity from the galaxy. As the pair rocketed away, they carriedon with normal stellar evolution. Themore massive companion star evolved more quickly, puffing up to become a redgiant and enveloping its partner in the process. The two stars spiraledtogether, merging into one superstar ? a blue straggler. "Whilethe blue straggler story may seem odd, you do see them in the Milky Way, andmost stars are in multiple systems," Brown said. Thisvagabondstar has puzzled astronomers since its discovery in 2005 by the Hamburg/EuropeanSouthern Observatory sky survey. Astronomershad proposed two possibilities to solve the age problem. The star either defiedthe normal aging process by becoming a blue straggler, or it was flung out ofthe Large Magellanic Cloud, a neighboring galaxy. In2008, a team of astronomers thought they had solved the mystery. They found amatch between the exiled star's chemical makeup and the characteristics ofother stars in the Large Magellanic Cloud. Therogue star's position is also close to the neighboring galaxy ? only 65,000light-years away. The new Hubble result now settles the debate over the star'sbirthplace. Astronomersusing the sharp vision of Hubble's Advanced Camera for Surveys were able tomake two separate observations of the wayward star 3 1/2 years apart. Teammember Jay Anderson of the Space Telescope Science Institute in Baltimore, Md.,developed a technique that measures the star's position relative to each of 11distant background galaxies, which form a frame of reference. Andersonthen compared the star's position in images taken in 2006 with those taken in2009 in order to calculate how far the star moved in relation to the backgroundgalaxies. The star appeared to move, but only by 0.04 of a pixel (pictureelement) against the background. "Hubbleexcels with this type of measurement," said Anderson. "Thisobservation would be challenging to do from the ground." Theteam is now trying to determine the homes of four other unbound stars, alllocated on the fringes of the Milky Way galaxy. "Weare targeting massive 'B' stars, like HE 0437-5439," said Brown, who hasdiscovered 14 of the 16 known hypervelocity stars. "These stars shouldn'tlive long enough to reach the distant outskirts of the Milky Way, so weshouldn't expect to find them there. The density of stars in the outer regionis much less than in the core, so we have a better chance to find these unusualobjects." Theresults of this study were published online July 20 in The AstrophysicalJournal Letters.